Consistent and reliable wind, miles of uncongested crystal clear lagoon and the no.1 beach in Africa. 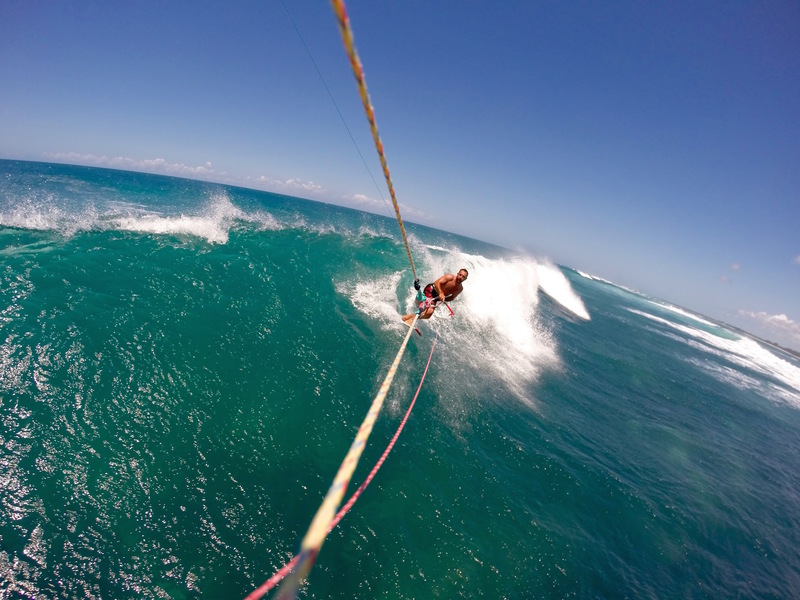 Galu Beach is an all-round fun kiting destination. It has an established kite community to hang around with. The reef parallel to the beach is an endless wave-riding playground. 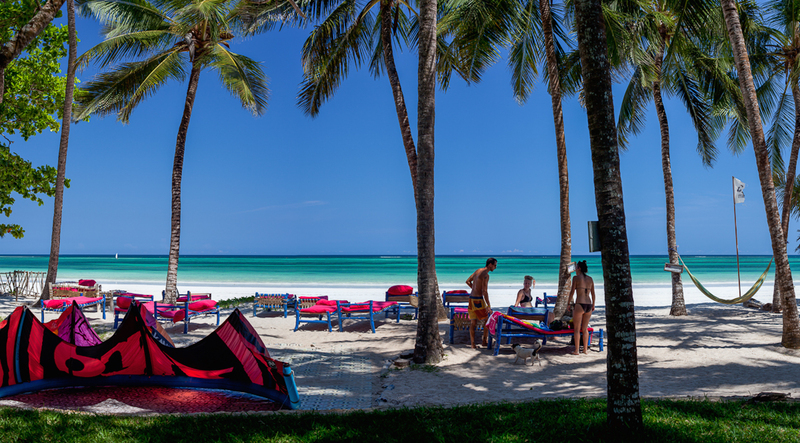 Galu is part of the tropical destination, Diani Beach which consists of a cluster of resorts, cafes, restaurants, shops and amenities nestled on a stunning beach amongst forest and wildlife. It is friendly, accessible and beautiful. The kitesurfing spot is perfect for learning and progressing with shallow flat water, a wide, soft, beach of brilliant white sand, warm water all year round, a safe environment and easy beach access. You will find the beach atmosphere very addictive and makes it great fun on and off the water. It's endless summer here, so bikinis and boardies all year round. Being on the equator there is minimal change in seasons and daylight hours. The coolest month is August (approx 25 celsius and building up to the warmest in March (approx. 35 celsius). The rain seasons range from April – June. The water temperature is never below 22 celsius. The wind seasons are bi-annual and are always side shore and consistent. This consistency has been relied on for centuries being the main trade route for east Africa, The Middle East and China. The ‘kusi’ (means south in Kiswahili) blows up from the southern ocean and is cooler and stronger and blows from April until September. It is about 25 knots + on average and brings in great swell so you can charge down head high waves on your 7m. The ‘kaskazi’ (means North) blows down from the monsoon in India. It is warm and solid and is very reliable. It blows from December through until March. Like clockwork it turns on at 10am every morning and turns off at sunset. It is about 20 knots on average and has flatter conditions so you can be on your 9m all day. Kennaways Kite Beach in all its glory! The beach road runs the length of Diani Beach which is about a 25km peninsula starting at Tiwi beach and on up to Chale island point. Galu beach consists of about 3km of this stretch. You can get a tuk-tuk for 100 KES by hailing it down on the road to anywhere. At night it is advisable to call a taxi and are also readily available outside bars and restaurants. The closest domestic airport is Ukunda Airport (Diani) 5km away, and the closest International airport is Moi International airport in Mombasa about 35km. To get from the airport to the beach it is best to prearrange a taxi to meet you for $40 and is a 2 hour cultural and scenic drive. You can also get an airport taxi for $55 when you arrive. There are also “Safari to the Ocean” trips; Arrive in Nairobi Int. airport, stay overnight in Nairobi the safari capital. Then 2 nights at the Masai Mara game viewing safari, 1 night Lake Naivasha bike safari, 1 night at Amboseli, the famous scene of mt Kilimanjaro, 1 night Tsavo east and arrive at Kenyaways. This is a fun and exciting way to save on a flight from Nairobi to the coast and fit in a 5-night affordable safari. Room with a view, and kite storage! Plenty of street and beach side restaurants and cafes and bars are scattered up the tropical beach road. The cuisine and catering is mainly European Indian and African with a range of price options starting from 50 Kes – 2000 Kes. Fresh seafood is guaranteed at all the restaurants and hotels as there is a very consistent fish supply coming off the beach straight from the fisherman. To buy fresh seafood you can go to the fishing village and negotiate the day’s catch. There are 3 main Supermarkets and you can get fresh fruit and vegetables from stalls anywhere along the road. There is a vibrant beach bar vibe in Diani. The nightlife is heaving in high season periods but it slows during low season. There is always a party to be had somewhere. Try 40 Thieves Beach for dance floor, Bidu Badu beach bar for fresh BBQ seafood and reggae vibes, Shakatak for a wild night out. For a more sophisticated low-key evening of cocktails try Kokkos café and bar, Havanas Cuban bar, or Lymingtons Beach bistro. The south side of Diani (Galu) is a quieter than central Diani. Fridays at Swahili Beach hotel for half price pizza and cocktails. Alternative wind activities such as SUP, kayak and surfing lessons are available at Galu with H2o Extreme. You can also go snorkelling on a traditional wooden sailing boat and you can go diving with ‘Diving the Crab”. At certain times of the year you might see whale sharks and humpback whales migrating. There are quite often dolphins and turtles to be seen around the reef. A safari is an excellent no wind alternative option; there are so many choices. There are direct flights to the Masai Mara so you can be there in 1.5 hours door to door. You can decide and book when you are here as there are plenty of tour offices. Be careful of going with the guys on the beach who will solicit at any opportunity and it usually doesn’t work out very well. There are also some local organisations that are worth a visit, such as the Colobus Monkey Conservation Centre whose purpose is to protect the rare and endangered Black and White Angolan Colobus. They are long haired regal looking monkeys with only 4 digits. Or perhaps make visit to the Kaya Kinondo sacred forest, the Mijikenda cultural centre of civilisation. Lastly sundowners at the Tiwi river estuary are a beautiful option to enjoy the baobab tree horizon at sunset. Kenya has excellent phone and internet available and is cheap and usually free in hotels, bar and restaurants. Visit a safaricom or Orange store and get a mini modem or sim card which you can use as a mobile hotspot for less than $10. Make sure you buy a data bundle with your airtime before you go online. Grab yourself some fresh fish to keep you going! Kenyaways is the most established kite accommodation on the beach, there are sea view rooms right at the kite spot, with a beach bar restaurant, showering and changing facilities. It also has a swimming pool and rooms with rates for different budgets. There are also self-catering options which are great value if you are in big groups such as Four Twenty South. For luxury accommodation, Almanara Resort has a kite centre base where you can get watersports assistance. Also, The Sands At Nomad has luxury accommodation and H2O Extreme Watersports has a base there also. Plenty of shade for you and your kit! Linzi was born and bred in Diani Beach. She is passionate about all watersports since a young age. She started kiting at 20 becoming the first woman in Kenya to tackle the C - kite era of learning to kite. She started teaching for other schools in various places around the world from the age of 22 and competed in a few amature competitions but never had the desire to make it pro as it would mean having to kite in cold water! She started Kenya’s first kite- village in 2008 and was a pioneer for bringing kite surfing tourism to Kenya. She also surfs and pioneered Kenya’s first surf school with H2o extreme Watersports. She has travelled widely in Kenya and Tanzania and Southern Africa, and driven South Africa - Kenya (and back) twice. In all her travels, she has found Kenya to be the most diverse with all kinds of beauty, the most friendly and helpful with people always willing to fix a puncture, or rescue you out at sea with their tiny fishing boat, or give you very bad directions. The Kenyans are creative and innovative and nothing beats their hospitality and originality in the camps and lodges. She now has a 2 year old son and cant wait to teach him all the disciplines of the ocean. Been to Diani Beach? What did you think? 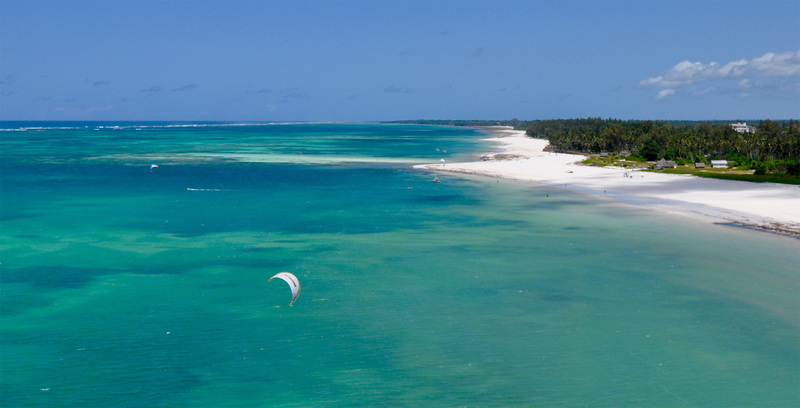 Where are the Best Kitesurfing Beaches in Diani Beach? The most popular spot and has a mix of flat and waves on the reef. When it’s really windy and an incoming tide it can get choppy and at Peak seasons it is quite busy (about 30 kites). Best sessions are low tide in the morning when its super flat and not busy or at sunset on a neap tide you are kiting on molten gold. One can also do moonlight kiting at full-moon, the conditions are ideal with glassy shallow, moonlit water. At high tide there is a really fun shore break with decent size waves in the Kusi season. There is constant supervision and landing and launching help here with beach showers, changing rooms, lockable kite storage and day beds for chilling after the session. “Mlango” means door way or opening and is the name given by the local fishermen to the gap in the reef. It is opposite the fishing village just a couple of tacks north of Kenyaways. The gap in the reef forms a nice point. The best waves spot in the area with a nice clean break. It can get shallow on the reef to the right (ie. North) so be careful at low spring tides. Waves all seasons but bigger in the kusi season. Just a couple tacks south of Kenyaways is a glorious sandbar with crystal clear turquoise lagoon and is hardly ever anyone there. It is best at low neap tides when it is not too shallow. Be careful of tourists wading around and boats moored. This is a deep channel just a couple of tacks south of Kenyaways . It has super fun waves where you can kite downwind and upwind on and off the reef. There are big waves on the outside for more experienced riders, and smaller ones on the inside. Waves all seasons but bigger in the kusi season. Another glorious sandbar with super flat water, but it can be full of boats and snorkelers in high season if its not too windy. But usually you have it all to your self. 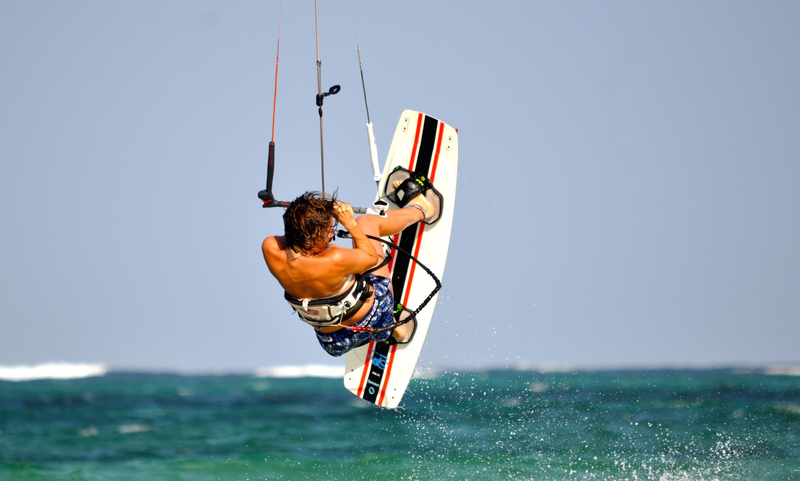 When is the Best Time to go Kitesurfing in Diani Beach?